Two days prior to Daeboreum, or the first full moon on the lunar calendar, on Feb. 17 (Sun), Seoul will celebrate the ‘Daeboreum Festival, Walking on Seoullo’ event from 15:00-19:00 at ‘Seoullo’ and ‘Malli-dong Square’ to the area around Seoul Station where citizens will plan and take part in the event. This festival will feature various traditional experiential events. ‘Treading the Daeboreum Bridge’ event will be held on the street from Magnolia Square to Rose Stage where citizens can drive out bad luck of the year and wish for health and longevity. At Magnolia Square will be Daeboreum experience booths with ‘Bureom kkaegi (Crunching Nuts) experience,’ ‘Gwibalgisul (ear-quickening wine) tasting’ and ‘Yeotchigi (taffy making experience)’ for all citizens to take part in. The ear-quickening wine tasting, which is believed to enhance hearing and bring good tidings throughout the year, will be performed with traditionally made wine by ‘Namchon Resident Group,’ composed of residents of Hoehyeon-dong. Citizens will be able to participate in ‘bokjori (lucky bag) experience,’ which is a reenactment of the custom of hanging ‘lucky bags’ in houses at the first full moon of the lunar year in the past. There will also be participatory ‘lucky bag making’ and ‘wish writing’ programs for families and children. 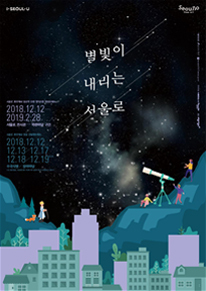 At Malli-dong Square, ‘Daeboreumdal,’ or the first full moon of the lunar calendar, will be exhibited for citizens’ appreciation, and experiential events involving ‘tteok maechigi,’ ‘jwibul nori,’ and ‘ganggangsullae’ will be held in the vicinity of the square to add to the excitement of Jeongwol Daeboreum (Great Full Moon Day), or the 15th day of the lunar calendar.